This contains all the articles, modified slightly, as of this writing. 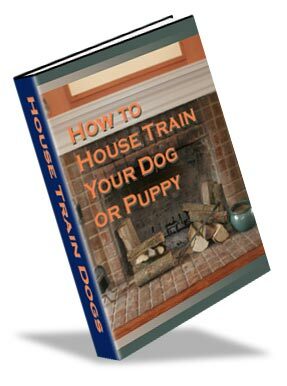 It focuses on dogs that have become problem barkers, tells you some reasons why they bark and gives you several ways to get your dog to stop barking. If you’d rather stay on this blog, this page gives you a summary of all the articles and also links to these articles as they are posted on the blog. You will also receive our newsletter articles periodically. Have you ever thought about how your dog got to be such an excessive barker? Answer: Dogs Are Bred To Bark. This post gives 4 Reasons Why Dogs Bark. When dogs became domesticated their level of barking went up. I think this is because the very first people that domesticated dogs discovered a barking dog would alert them to intruders. What better than a barking dog to keep the local barbarians away or at least warn if intruders were approaching! So if a dog was a good barker then he was allowed or encouraged to breed again. If you can start with a puppy and reinforce good dog behavior you’re in a great position. When your puppy starts barking, the first thing you want to do is go over to your dog and find out what he’s barking about. Maybe there is an intruder or he’s lost his toy under the chair and needs help. Once you understand what all the barking is for you can then take appropriate action. If he’s barking at a stranger out the window, you can acknowledge that your dog has seen something. “Yes Fido, there is a person walking a dog outside.” Then tell your dog “No Bark”. To manage this you may need to remove the distraction. Close the blinds or take your dog to a new place. 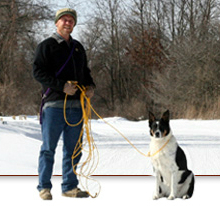 Most of dog training is about being consistent, persistent and patient. If Fido keeps barking after you’ve said “No Bark”, then you can use “Quiet” followed by a correction. What’s a good correction for your dog? It really depends on your dog, but a small dog or puppy shouldn’t need much. Get in Fido’s face, put your hands firmly on his neck to get his attention. Then say “Quiet”. You really want Fido to know who’s boss and that you are serious. Take the dog away from the thing that is making him bark. When all is quiet say “good dog” in a clam voice. Management is key to effective training. If you repeat this every time your puppy barks too much you will teach your puppy that it is OK to bark once when he notices something but then to be quiet after you find out that it is OK. After all, you’d hate to teach your dog never to bark and have an intruder walk into your house. Most dogs become problem dogs as a result of human dog owner interactions that send the wrong messages to dogs. Inexperienced dog owners inadvertently train their dogs to have problems. Too much barking is a big problem. All your neighbors are probably very irritated at your constantly barking dog and you don’t like it either. You can get a ticket from the police for a barking dog that could cost you a bunch of money too. Cruel neighbors have been accused of hurting or poisoning dogs that seem to them to be a nuisance. I would hate for that to happen to your dog. Is Your Dog Alone In The Yard For A Long Time? Many dogs develop barking issues primarily due to loneliness and boredom. They are looking for attention from anything that moves or walks down the street. Dogs are just like children when it comes to the need for companionship. And when these animals have nobody around for long periods of time, sheer loneliness will cause them to invent games and make toys out of whatever is available. From the start of these “invented games” come habits that progress and create a problematic dog. 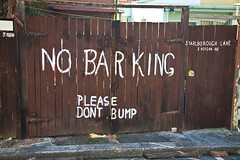 What Are you Doing To Encourage Barking Without Even Knowing It? Dogs are not necessarily being “bad” on purpose when the constantly whine and bark. They are trying to get some attention for whatever reason. They probably want to play or get your attention. However, unchecked, or worse, reinforced barking can make your dog seem like a huge problem. If you hurt (smack him or worse) your dog every time he barks he’s going to learn to stay away from you. You are not to be trusted. You are only punishing him. You have not given him an alternative or praised him for any good behavior. How does he know what he’s supposed to do? You could be reinforcing the excessive barking behavior. If your dog barks for a long time until you can’t take it anymore, you are strongly teaching your dog to keep barking, because I will eventually get some attention. When your dog starts too much barking you need to address the barking right away and tell him to stop, then remove him from the situation so he can stop barking. When he’s quieted down tell him “good dog”. This way he’s got a chance to learn something. Many dog owners unwittingly create and instigate certain bad habits that their pets have developed, such as excessive barking problems. For example, one extreme case in point is a man who would put a bowl of food in front of his dog every time it barked. Her reasoning for this action was “My dog can’t bark and be a problem if something is in his mouth”. As you can guess, this repeated action only confirmed in her dog’s mind that barking is a good thing and that tasty treats are the result. Another example is the family that decided to finally get a dog that the kids have been wanting for years. Instead of buying a young puppy, they decided to adopt an adult dog from the local Humane Society. As soon as the new dog was on the front lawn, a stranger walked by the house and the dog began to bark incessantly. Of course Dad was elated at how his new dog was such a wonderful guard dog so he showered the animal with kisses and affection. Needless to say, their new “family protector” was instantly taught that barking was good and that he should bark excessively at anything that moves within visual distance. In time, these dogs’ “acts of courage” turn into acts of nuisance to everyone in the neighborhood. First of all you will need to stop supporting your dog’s excessive barking behavior. You need to discover what exactly gets your dog barking and counter this behavior with correctiona and praise. Did you know that it takes less than a week (on average) for a dog to learn a basic principle? In this small time frame anyone with the desire and patience can teach their dog that excessive barking is definitely an inappropriate behavior. You can make your dog understand that there are some occasions when barking is permissible, but that it must be “turned off” when given the proper command. The secret weapon to getting this point across to an excessive barking dog is by communication. Communication simply means “finding a way that your dog can understand exactly what your desires are”. When we communicate to another person, we just say the words we mean and it is automatically understood, but with a dog you must resort to methods which are backed by action. This is key: Never give a command that you are not prepared to back up, or maybe not give in on is also a way of backing up a command. Using a squirt gun is a humane and effective way to distract your dog from barking and change the barking behavior. However I would recommend this as a last resort and try communicating with your dog in other ways first. Don’t use this on a young puppy, only if your dog is really stubborn and you can’t get his attention any other way. It is going to take about a week for your dog to get the message. Please commit to spending seven days in a row giving your dog the message and you will see results. Don’t cave ever. Make your plan and stick to it. When your dog is barking too much, calmly walk over to him and in a loud voice say “No” or “No Bark” them immediately squirt him in the face with the squirt gun. Stay calm. Without saying another word, go back into the house and be ready to repeat this lesson. From now on your goal is to be consistent and have the attitude that whenever your dog barks, he is really asking you to come out and give him a squirt of water! These three simple steps is all you need to remember whenever your dog is barking for a reason you don’t support: 1. Give a strong verbal command. 2. Give one sudden squirt. 3. Repeat whenever you hear barking. If you’re going out to spray your dog with water every time he barks then why not just tell your dog “no bark” and give him some attention. While you’re out there take a look around and ask your dog what he sees. Maybe he’s guarding. If you find nothing then give the command “no bark”. If he keeps barking then use the water gun and firmly Command “no bark”. If you do not think that this simple method works, give it a few days. I guarantee that you will hear less and less barking coming from your dog. Before you know it, he will come to the conclusion that you just don’t understand “dog talk” at all, and he will not want to continue being squirted in the face. Your dog is an intelligent creature that responds to repetition. In under a week, he will decide that he doesn’t like your little “game” and the barking will stop. Your dog will understand that the best way to avoid being squirted from your squirt gun is to keep quiet. After five to six days of your consistent training, if your dog happens to forget his barking lesson, all it should take to put him back in place is to give the same firm command which accompanied the water gun sprays. However, no squirting will be necessary, as he will relate the firm command to the feel of being squirted with water, and the barking will stop. The point of the squirt gun is to get your dogs attention and distract him long enough for you to tell him to “Quiet”. The water in the face also acts as a correction because the dog doesn’t like it much. If your dog happens to like the water in the face trick you’ll need to try something else. Loud noises can be an irritant to dogs. Dogs don’t like loud noises and at least it will get their attention. You could use tin cans tied together on a string. All you need is about four or five tin cans, a touch of sneakiness, and an accurate throwing arm. To make them really noisy put a few small pebbles inside the cans for a big startle. Or you can just use one can with some pennies in it and shake it really hard. So when your dog is barking up a storm unwarranted, you need to toss your noisy can collection in the direction of the dog. Do not hit your dog with the cans! The noise will startle him. As soon as the cans land near your dog, you should immediately give a loud command such as “NO” or “No Bark”. Within a few days, your dog will then respond to your command by i stopping his barking and you won’t need the cans. He’s going to associate No with cans, not want the cans and stop before the cans come. That is why you need to give the commend first, then toss the noisy cans. You may want to have a few sets of noisy cans ready. Once you throw them you’ll have to go get them giving your dog a chance to bark un-reprimanded. An intelligent dog knows whether his owner is home or not. So, he knows if he can get away with bad behavior; if no one is there to correct him. It doesn’t matter how well trained your dog is, he has desires of his own that are sometimes just too hard to contain. Since you dog will behave better when you are around, then not, you can make it seem like you are there even if you are gone. First of all you want to trick your dog into thinking your gone. So you leave the house by whatever means you normally do, then sneak back so your dog can’t see you. Your dog’s senses are far better than yours so this could be tricky. Don’t make any familiar sounds and make sure the car drives far away so he can’t hear you. Also, breezes in the house could alert him to your scent. If your dog is a backyard dog, and you have managed to sneak quietly into your house unnoticed, sit back, relax and wait. The instant he starts to bark, you should emerge from your house with a water gun, your tin cans, or even water-filled balloons to toss nearby. This entire scene is be repeated as many times as necessary to get the point across that, although he hears and believes you are gone, you’re really just “one bark away”. If your dog is a house dog, all of the members of the family should join in the staging of the schooling. In other words, everyone should leave the house together and walk toward the car. One member of the family should remain on the front porch (out of site), while the rest of you drive away. At the first bark from your dog, a family member who stayed behind on the front porch should be the one to burst through the door like a wild bull, give off a loud firm command, and accompany this with your weapon of choice: a squirt gun or a set of tin cans. One dog owner put a two way radio in his house (like a baby monitor) and left. He listened for quit a while until his dog decided to start barking. At that time the owner rushed home and gave his dog some “Quiet” commands followed by unpleasant squirts in the face. He had to repeat this several times but the dog finally got it. What About A Bark Collar? Great tips and suggestions on excessive barking! Here’s 10 more articles on barking; everything from what barking means, to how to stop it, to how to determine if it is a sign of something more serious, like separation anxiety.